Braised cabbage and potatoes, with bacon, onion and chiles. 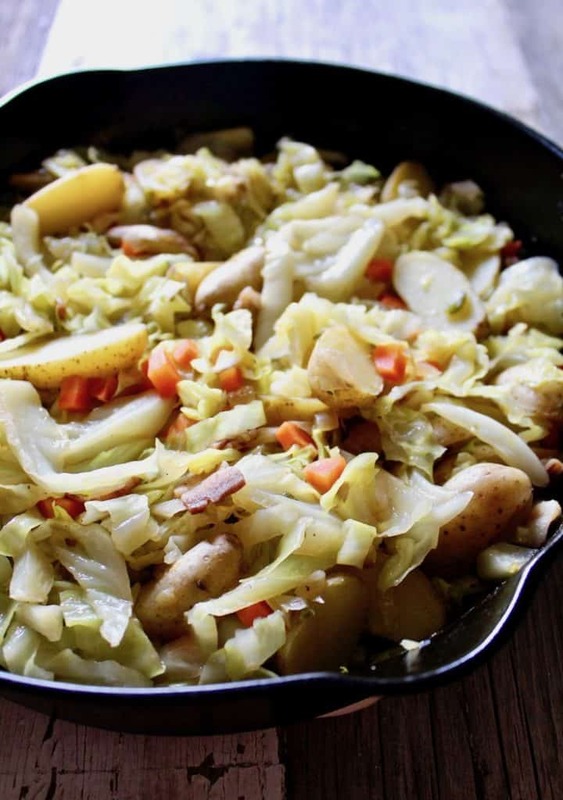 Easy and delicious stove top fried cabbage and potatoes recipe. I love cabbage yet I hardly ever make it. Sort of a lowly vegetable I just forget about. Maybe if I’m making a cole slaw in the summer, or definitely on St. Patrick’s Day. But otherwise, I forget about it. I saw a recipe on Food 52 for braised cabbage that caught my eye. 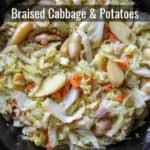 I added potatoes and tweaked it slightly and came up with my new favorite winter side dish, Braised Cabbage and Potatoes. Made in one skillet, always a welcome method. 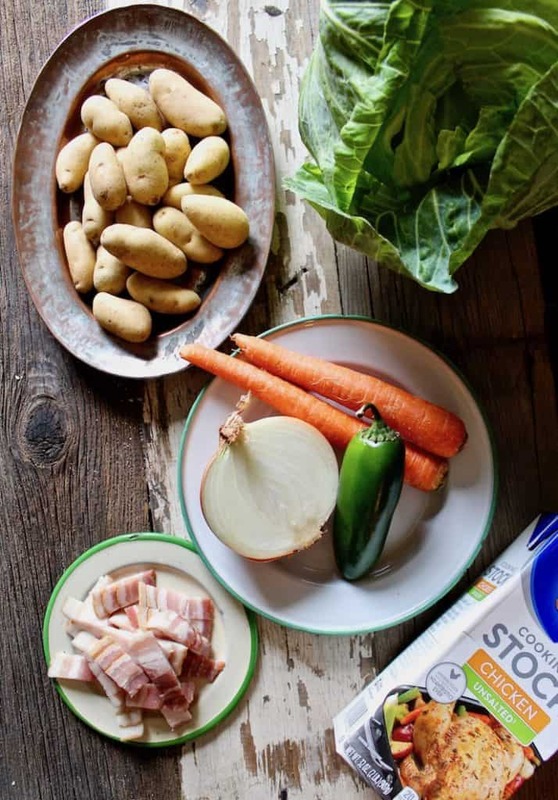 Sauté some onion, bacon and jalapeños, then add some little bitty potatoes, cut in half, continue cooking a few minutes. Then toss on a mound of sliced cabbage, some diced carrots, a sprinkling of salt and pour in some chicken stock. Let it simmer until it’s all tender and melded together and smells wonderful. 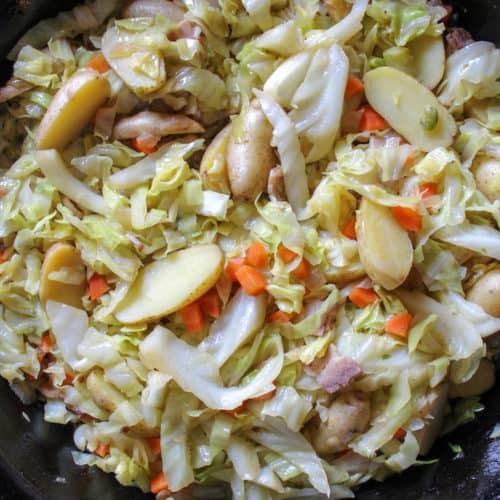 If you’ve tried this Braised Cabbage and Potatoes, please rate it below in the comments and let me know how it went ~ I love hearing from you! HUNGRY FOR MORE? Subscribe to my Newsletter and come hang out with me on PINTEREST, INSTAGRAM and FACEBOOK for all the latest updates. 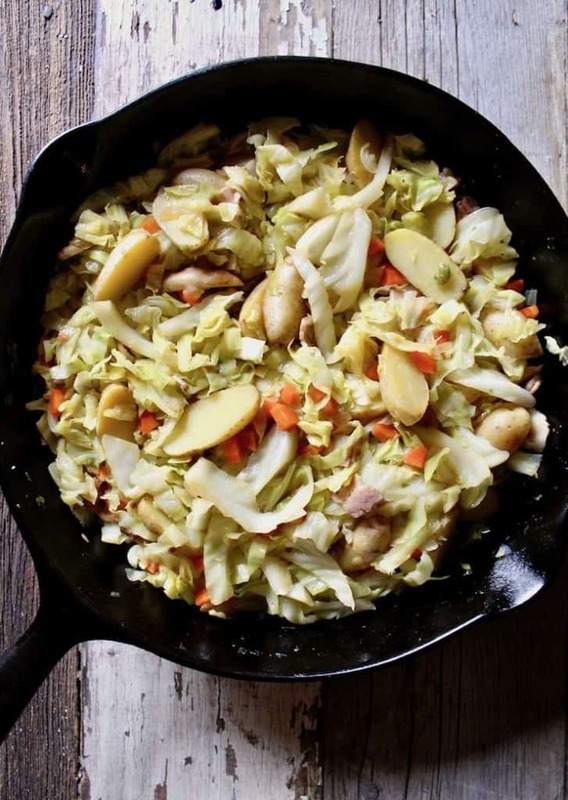 Cabbage, bacon, onion, chiles and potatoes braised until tender and flavors have melded. Delicious and addictive, great with breakfast, lunch or dinner. In a large cast iron skillet over medium high heat, heat oil until shimmering. Add bacon, onion and jalapeños, stir and cook until the bacon and onions start to brown, about 5 minutes. Push bacon/onion mixture to the side and add halved potatoes in the center of the pan. Let cook a minute or two and then stir and combine with other ingredients. Continue cooking and stirring for another 3 or 4 minutes until just starting to brown and get tender. Add cabbage, carrots and salt. 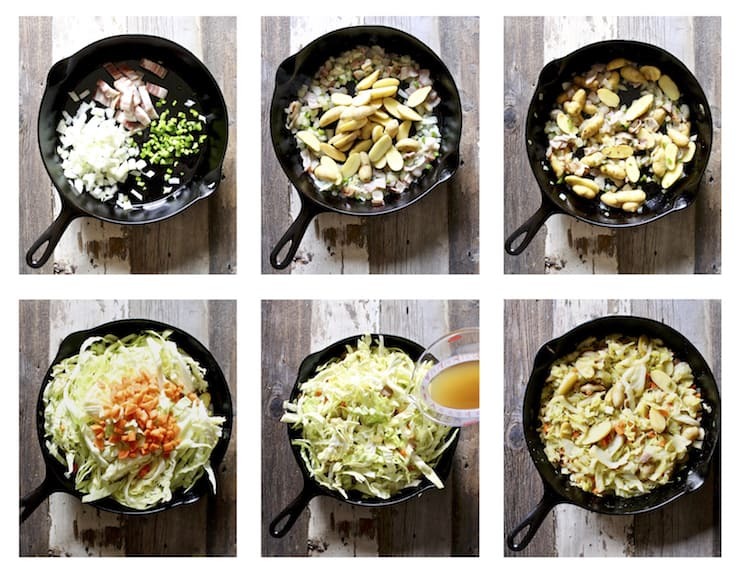 Stir to combine and pour chicken stock into pan, reduce heat and simmer and cook, stirring often until cabbage is wilted and potatoes are tender, about 20 more minutes. Careful not to burn, adding more stock or water if needed. Taste for salt and serve. I couldn't remember how many potatoes I used. They came in a mesh bag, very small fingerlings, and I used half the bag. I'm guessing 6 - 8 ounces.